Philanthropy can take many forms – making financial contributions, volunteering time and sharing knowledge are all valuable ways to give. Longtime Santa Barbara County resident Bill Cirone has dedicated his life to serving his community in all of these ways and more. 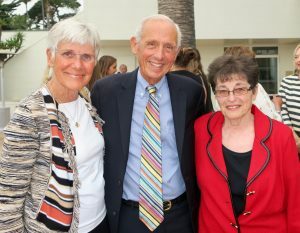 Bill Cirone (center) with his wife, Barbara Cirone (left), and former Woman of the Year Barbara Tellefson (right). Photo courtesy of Noozhawk. Bill served as the Santa Barbara County Superintendent of Schools for 32 years before retiring in 2017, and sat on numerous community organization boards. He is a former Santa Barbara Foundation Trustee (including two years as Board Chair) and was selected as the 2012 Santa Barbara Man of the Year. The Cirone Family Fund at the Foundation has made significant donations to several organizations, including the Santa Barbara Scholarship Foundation, the Partners in Education program (a volunteer program for community members to engage with students from local schools), and the Women’s Fund of Northern Santa Barbara County. They are dedicated to supporting organizations that are cost effective, efficient, and have a tangible impact on communities in need. Bill’s impact goes well beyond typical philanthropy. In the 1980s, it was discovered that the Casmalia School District (located in North County) was being polluted by a local hazardous waste landfill. Bill and fellow educator Ken McCalip, Casmalia Superintendent of Schools, were a critical part of the effort to demand justice for the small town. The two men struggled to navigate a convoluted legal system, but ultimately their perseverance paid off – the community was awarded the largest legal settlement in county history. Following his retirement, Bill remains active in civic engagement. On the county level, he serves on the Boards of the First 5 Commission, the Behavioral Wellness Commission (which focuses on mental health), Fighting Back (a coalition to combat drug and alcohol abuse), and the Zaca Center Preschool in Santa Ynez Valley. Bill also serves on the Board of the Hazelden Betty Ford Foundation, a national organization that runs many of the top substance abuse treatment centers across the country.